Best crock pot recipe ever! Have shared with many. Thanks! This soup was so good! I made it last week and plan to make it this week for our company. I made this on Sunday for lunches this week at work! Great recipe I loved it! Does the chicken need to be cooked before putting in the crock pot? I’m new to this and don’t want to get my family sick . Thanks! The chicken is placed in the slow cooker raw/uncooked but not frozen. Straight from the fridge will work fine. Enjoy! 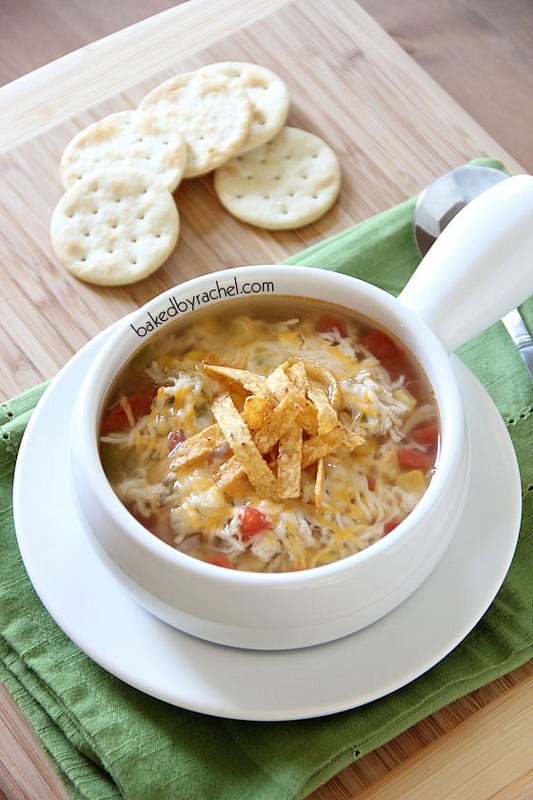 I’ve been making this a couple of years since I found it on Pinterest and I LOVE this soup! 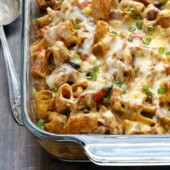 It’s amazing just like the recipe but I love adding things in and substituting ingredients to fit my family’s tastes. My favorite thing to do is add a can of black beans and/or diced black olives, then about 5 minutes before serving I cut up a block of cream cheese and stir it a few times until it’s all melted. My kids like things very mild so I usually substitute the tomatoes and peppers for a can of mild rotel. I just love how endless the possibilities are when making it and it still turns out fantastic every time. 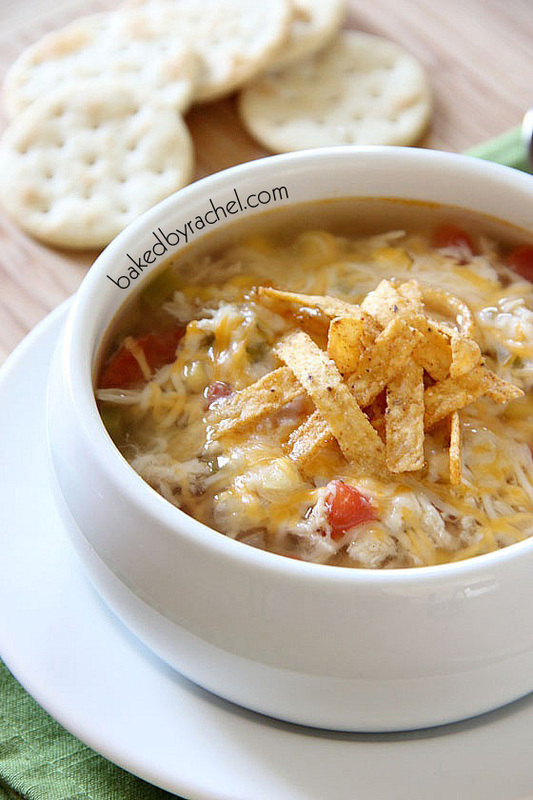 This is our absolute favorite soup recipe! Thank you so much for posting it! So glad to hear you’ve enjoyed it so much! Thanks for sharing, Jennifer! Can I combine all ingredients and freeze before cooking? Want to make this for a friend but want her to make it when she wants it… Not because it’s going bad in her refrigerator… Thanks! I’d suggest cooking and freezing in smaller portions to thaw and eat as desired, vs freezing and then cooking. This way it’s ready to go and you don’t have to worry about chicken or vegetables getting freezer burn or any other issues. What size crock-pot did you use for this? Mine tends to be smaller than most recipes call for, I don’t want to overflow. Thanks! I use a 6 quart slow cooker. The smallest size I would recommend trying is 4 quarts and that may be tight, but should still work. Anything smaller and I’d recommend reducing the ingredient amounts to accommodate your size. Wondered if I could use ground chicken breast? You could certainly try it. If you do, definitely at least partially cook the meat before adding to the slow cooker. Good luck! Amazing, yet SO SIMPLE! I made this in my crock pot while on hold with a phone call! I have 2 teenage boys and a husband that all LOVED this. I substituted the green peppers for chopped green chilies and added cumin and cilantro to the ‘first 9 ingredients’. I also used organic chicken thighs with very very little fat on them and it added some great flavor to the broth. I garnished with lime squeezed in the bowl as it is served (really adds a punch to the flavor)- do not add lime before you serve or it will get bitter in the soup as it cooks. My oldest son wants me to keep this recipe for him when he moves out so he can make it on his own. Huge compliment to say the least….. Recipe sounds delicious! I can’t eat corn. Can you suggest something to substitute? You could easily substitute with beans or additional peppers. Enjoy! This looks great and I love that there’s no ‘cream of’ soups involved. Pinned! Made this yesterday. Will be making often. Use Rotisserie chicken for quick dinner. Also, because it is in season, I used fresh corn. Amazing flavor. 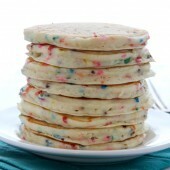 One of the best recipes on Pinterest. A must try. Delicious and easy soup. I served with tortilla chips and cheese. Yummy! Silly question, when you say green pepper.. do you mean green bell pepper? No. 2 and 4 are missing above which means the recipe is incomplete. Would love to have tried this. Nothing was missing. The recipe is correct as written. There simply seems to have been an issue when converting from different recipe formats. Enjoy! Hey Rachel! I am hoping to make this for our small group this week, but work doesn’t allow me to come home for lunch to put everything on. Do you think I could combine all of the ingredients (except the chicken) in the ceramic crock pot the night before, leave it in the fridge, take it out in the morning and add the chicken, cook on low for 7 hours and then on “keep warm” for a couple more till dinner time? I didn’t know how the flavors would do overnight all mixed together or if the soup would overcook during the day. Thanks! I wouldn’t recommend refrigerating everything in the bowl the night before. Instead, you could add all of the vegetables to a gallon bag or large sealable container to chill overnight. Combine the veggies, liquid and chicken in the morning. It should be just fine cooking on low and then staying on warm for a while. what does the C stand for in recipe? EG: 5 c chicken stock. Sorry, new to this so learning…. If I use already cooked chicken…would this recipe still work? Put in slow cooker for maybe a couple hours on low? Thanks! cream sometimes. I use jalapenos as they are more commonly found here in TX year around. . The amount will vary depending on how much each person is served. For average servings, this will yield roughly 8-10. Absolutely delicious! Do you have any nutritional information (specifically, calories) of the soup that you can share? Thanks, Terri. I don’t offer that information, but there are free online calculators you can use to figure that info out. Is the chicken cooked before added to the slow cooker? I made this for dinner and it was delicious! Quick and easy recipe. Best ever!!! So glad you enjoyed it, Sonja! Does this thicken up at all as it cooks?mine has been cooking for 4 hours and it’s very watery looking still! This is a broth based soup. It does not contain any cream or thickening agents, so it will remain thin. This soup was so delicious. I made it on top the stove because I was in a hurry. It was so easy and definitely a hit with the family! So glad to hear you enjoyed it, Joanne! How long would you cook it if you add shredded chicken that is already cooked? Toss it in towards the end of the cook cycle when you’re almost ready to eat, just enough time to warm it up properly. Loved this one! Deviated a little since I didn’t have the canned tomatoes so added one fresh tomato and can of enchilada sauce. Also some cilantro and a lititle cumin. 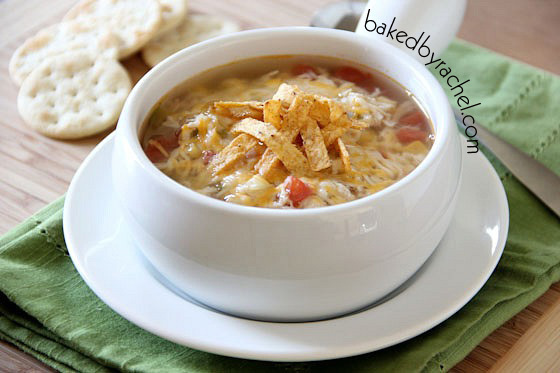 This one is my new go to chicken tortilla recipe! Yummy!!! So glad you enjoyed it, Laurie! Cheese, sour cream and cream with flour are all great options. 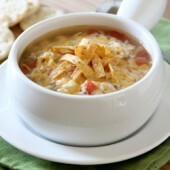 I have a recipe for cheesy chicken tortilla soup that may be closer to what you’re looking for. This is so good! Top it off with some cheese and crema and it’s amazing! This is an amazing soup! It is definitely one of my top “go to” recipes. Thank you for sharing it with all of us. Love this recipe! It has been a family favorite since I found it on your site a few years ago!